Manchester-based Serena, now 18 and pregnant, discovers the shocking reason why Tile X has befriended her. She doesn't like what she hears. Mayhem ensues, with a retired Irish police superintendent becoming more involved than perhaps he should be. The Hostile Game is the third book in The Hostile series of gripping paranormal thrillers. Each book in this unusual series can be listened to as a standalone. 'The Hostile Series' was a fun read. I liked this third book a great deal because we finally learned more about what was up with the paranormal 'entity,' Tile X. I think this final book took some serious risks that made for an unpredictable and thrilling read. I also really appreciate that this book had an ending (unlike books one and two in the series). It says in the description that these books can be read as stand alone's and I disagree with this. This book had a lot of poorly written exposition at the top of it to try and accomplish the stand alone goal. It didn't accomplish the goal and should be taken out - these books should definitely be read as a series! 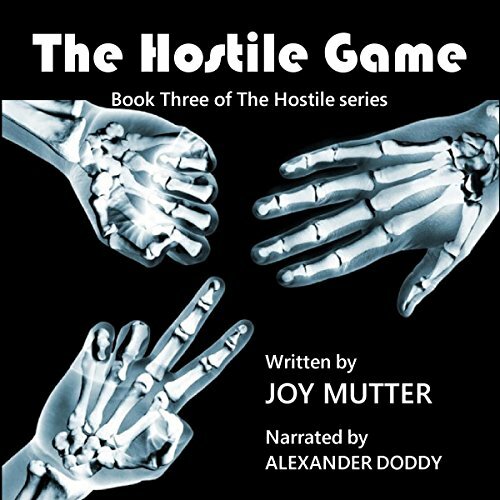 Another awesome read from Joy Mutter!I love this series!This one was especially good.Alexander Doddy is the perfect narrator.I was given this book by the narrator,author or publisher free for an honest review. If you've ever walked into a movie after it's started, and you regret that you did so because you get pulled in right away, that's how The Hostile Game feels. My understanding was that this book, although the third part in a three-part series, can be read as its own stand alone book, it still felt like I was walking into the middle of a movie where people knew each other well before I arrived. However, I'd like to give myself credit for being bright enough to pick up on subtleties and nuances of relationships and situations without having every last detail spelled out for me. The surprises and twists that occurred later in the book were great because I understood enough to think Oh Boy, that just happened! Alexander Doddy portrayed the characters well and kept the action well-paced. He made me want to keep returning to the book when I had to reluctantly hit the pause button. So even though I was gifted this book at now cost in exchange for this honest review, I will now want to go back and revisit books one and two just to get the complete story for context. This is a fun, paranormal thriller and a great roller-coaster ride of fun. Highly recommended. What did you love best about The Hostile Game? This book in amazing. It has an interesting story with a surprising ending. I really enjoyed it and would recommend it. I received the book free for an honest review. I would've gladly paid for it. What was one of the most memorable moments of The Hostile Game? The ending was unexpected. Really a memorable one for me. What about Alexander Doddy’s performance did you like? I enjoyed the way he portrayed every character. This is my first intro to this author. I will read and enjoy her paranormal thriller books one after the other. I knew in the first few pages that this book had my undivided attention. I never reveal details in a review....just read this book and be riveted page after page. I have listened to the previous parts of this series . The twists, turns and surprises that kept my intrest in the story ! this was a great story , great characters ! If one haven't read its previous parts its not a thing to worry this part is a standalone . But i suggest you to start from 1st part . This is the last book of the series (I believe) and the best one yet and ending suggest a possible new series with Tile X and maybe rare appearance of Serena. Believe you should read 1&amp;2 first for full effect. Recommend to anyone one who enjoys different paranormal. I was given this free review copy audiobook at my request and have voluntarily left this review, Thank you! Already hooked by the first two books in the series, I couldn't wait to read the third installment. Such an intriguing and utterly unique storyline that maintained momentum throughout. There were so many twists and turns that the reader was kept on tenterhooks! I love these books to read & listening to them just gets better! I wait as patiently as I can until the next instalment. Joy has me hooked with Tile X & his exploits. Poor Serena in this 1 though. She doesn't have the easiest of anything. Looking forward to the next 1 in audio book. Narrator was great. Such a relaxing voice.